Insert the data to find the maps compatible with your navigator. The easiest and fastest way to download an update is to use the AvMap Suite app for PC. AvMap Suite will automatically read all the info in your EKP V. Download AvMap Suite now! Moving map excellence: super detailed, with the most reliable official data. 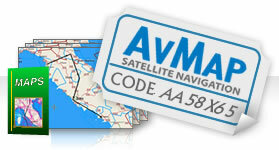 When you buy a AvMap navigator, you are guaranteed the latest released aeronautical database. The quickest and cheapest way to keep your EKP V up-to-date. Subscribe for 1 year, get 13 Jeppesen cycles and save more than 50%! Subscribe to the Seattle Avionics update service for your EKP V.
With AvMap Suite you can convert and import charts into EKP V!